American English has more vowel quality distinctions than any other language, so no matter what language you speak, it probably does not have as many distinctions as English. English pronunciation has several pairs of vowels which are pronounced with your lips and tongue in approximately the same position, but where one of the vowels is "tense" and one is "lax". The fact that these vowels are so similar makes them difficult to distinguish for non-native speakers. The first tense/lax pair is what many people call long e versus short i. The fact that one is called an 'e' sound and one is called an 'i' sound is only because of spelling; more technically, these are both 'i' sounds. If you are familiar with the International Phonetic Alphabet, this is the distinction between /i/ (long e) and / i / (short i). Long e is often spelled ee or ea in English spelling (which is why it is called long e). Examples include 'feed', 'seat', 'see', and 'bead'. Short i is usually spelled with a single i and usually comes before two consonants in the middle of a word or before a single word-final consonant. Examples include 'bitter', 'fit', 'tipsy', and 'lip'. The easier sound to make for most people is the long e sound; almost every language in the world uses this as one of its vowels. In your language, this sound is probably spelled with the letter i. Beginning with this long e sound, relax your tongue without moving your lips. If done properly, this should get you very close to the short i sound. A good practice exercise is to listen to minimal pairs - words that differ only in one sound. Pairs which differ only in tense versus lax i are: feet/fit, seat/sit, bead/bid, leap/lip. Many students learning English are puzzled by the connection between English spelling and English pronunciation. They look at words with similar spelling patterns like rough (pronounced like "ruff") and cough (pronounced like "coff") and wonder if they will ever be able to figure out how to pronounce American English words! Many native speakers, too, complain about the seeming irregularity of English spelling. There have been various movements that have tried to reform English spelling, but to date none have been successful. What is it about English spelling that makes it appear so confusing? Before answering that question, it is important to understand what the words are representing. In alphabetic languages like English, the letters and letter combinations represent the sounds of the language. Some languages, like French, have standardized these representations so that there appear to be fewer irregularities than we have in English. However, English spelling gives us not only information about the sounds and pronunciation of the words, but also the history. English has been a remarkably adaptable language, and English speakers have incorporated words and pronunciation from many languages. English words like "phone" or "photo", for example, show us with the "ph" spelling of the /f/ sound that they are words derived from Greek. Other unusual spelling patterns have their roots in the history of English. So what does this all mean for English language learners? Well, first of all, you don't have to go out and study the history of the English language in depth, but developing a curiosity about English words can really help. English spelling is not as irregular and unusual as many people think it is. Knowing a bit about the history of some English words can help you begin to see the pattern behind American spelling and American English pronunciation. We use words to tell the stories of our world and lives. Words have their own stories to tell us about the development of our languages. How can children's nursery rhymes help adults improve their pronunciation of English? For some of the same reasons they help English-speaking children learn the rhythms and rhyming patterns of their first language. Nursery rhymes draw children's attention to important features of language, and have been demonstrated to help children learn the rhythms and intonation patterns of English pronunciation. They also help children learn to articulate different sounds because they often use repetition within the nursery rhyme. While adults learn language differently from the ways that children do, learning and repeating nursery rhymes can still be of great benefit to adult learners of English. Nursery rhymes provide short chunks of language that can be easily learned and repeated. They provide a manageable piece of connected language for practice and review. In addition, nursery rhymes provide access to a part of English speaking culture that is shared across countries. As there are many references to nursery rhyme characters, having knowledge of the more common rhymes gives English-language learners insight into an important part of the culture, and pronunciation. Another advantage of nursery rhymes is that they are very easy to find. Any bookstore that carries English books for children will almost certainly have some kind of collection of nursery rhymes. English public libraries have many different versions of the familiar rhymes, and an internet search of "nursery rhymes" or "Mother Goose" will bring up many useful links. Some of these will have audio files so that adults can listen and repeat the rhymes. YouTube even has a series of American English pronunciation lessons for ESL learners based on nursery rhymes. It's clear that nursery rhymes are not just for children! They are an effective way for English learners to improve their pronunciation. Word stress is important in English pronunciation, and in some cases can signal a difference in meaning or word category between two words with the same spelling. Sometimes, when this stress shift occurs, there is a significant difference in meaning between the two words. For example, EX-ploit means adventure, and ex-PLOIT means to take advantage of a person or situation. Next time you listen to the news in English, try to listen for some of these words. See if you can distinguish which stress pattern you are hearing. 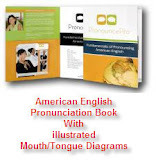 American English Pronunciation improvement need not be difficult. Practicing word stress is an efficient way to quickly improve your pronunciation. Writing: noun Something that is written or printed. Welcome to the Writing section of the Online English hub's Article lesson Library. Writing is an art and it's a skill you can learn. From simple social letters to your friend network or your thesis in a University, we have it covered in our Writing lesson area. Our lessons cover basic sentence structure all the way to an exploration of the advanced writer's craft. Learn what great Writing is.. If you have questions about Writing you may submit your questions to the Online English Learning Tree for Free. The Teacher Staff at the Online English Hub will email you the answer. To see more lessons on Writing visit the Writing area of the Online English Hub. The have new lessons weekly for Free. Learn to Write better with our Writing Online Quiz and Answer Library located on this blog. "Put your pen to the paper and write your dreams." Enjoy the resources. Spelling: verb To name or print in order the letters of a word. Welcome to the Spelling area of our Online English article library. Spelling is important to learn because it will help with your English Reading. When you are better at Spelling, reading quickly and efficiently is easier. Also being able to write words correctly for flyers around work or notes to your friends in English is a good skill. Spelling can be made easier by reviewing the rules within English spelling. Spelling in English is easier when you know the Rules! Remember to ask any Spelling questions to the Teacher Staff from the Online English Learning Tree. This is a Free learning feature within the Online English Hub. Visit the Spelling section of the Online English Hub for more Spelling lessons. Learn Spelling with our Spelling Online Quiz and Answer Library located on this blog. Reading: verb To comprehend language by interpreting written symbols for speech sounds. Welcome to the Reading area of the Online English Article Library. Reading is a big part of learning English, it's everywhere. We need to read instructions, read signs, read books, read menus, read tickets, reading really is ubiquitous. We have two main types of reading lessons here. You may choose from our reading lessons that instruct on How to Read or you may choose from our reading lessons that are interesting, useful, and fun articles and entries to read. After each article lesson you read there are questions to practice your reading comprehension. We recommend you polish up your reading techniques with the Reading Technique lessons then move into the fun reading entries and articles for comprehension practice. If you have questions about Reading you may submit questions to the Online English Hub's Teacher Staff for Free using the Online English Learning Tree feature. For more Lessons on Reading visit the Online English Hub's Reading area. They have many more fun things to read with reading comprehension online quizzes. Remember to take the online quiz at the end of each article. The answers are there so keep track of your comprehension progress. The lessons are all written just for you by our Teacher Staff. If you enjoy reading the lessons they would love to hear comments from you! You can visit the whole Staff at the Online English hub. You can even email each individual teacher if you like. They love getting mail from Pronounce Pro plus students. "Read a book a day, it's the best way." Relax and enjoy our written stories. Idiom: noun An expression that cannot be understood from the meanings of its separate words. Welcome to the Idioms section of our Online English Article Library. Idioms are phrases commonly used in American English speaking and writing. Idioms are used in formal settings and casual settings. An Idiom is two or more words that when said as a full phrase means one thing however each word of the phrase when spoken alone mean very different things. Idioms are important to learn because English speakers use them and if you do not speak English with some Idioms correctly you will get a reputation of being a boring or unimaginable speaker. We don't want this. It is fun to use Idioms and native speakers will be able to relate to your speaking and you will be able to understand their natural speaking when you have studied American English Idioms. Every language has Idioms. American English has more than the usual amount of Idioms. Why are there so many Idioms in American English? One reason is because as our world and culture evolves we find more situations we need to speak about. Instead of creating new words from the sounds of the American English language we create Idioms. Idioms are new expressions using the same words. We have Article Lessons on all areas of Idioms within American English. Find out what Idioms are and why they are SO important to learn. Use our Idiom Transcriptions to see Idioms being both used in writing and defined. Our Idiom Online Quizzes are perfect for Learning Idioms quickly. If you have questions about Learning Idioms you can ask the Teacher Staff of the Online English hub for Free using their Online English Learning Tree feature. For more Idioms Lessons visit the Online English Hub. A young lady named Dawn gives new Idioms Video Lessons each week at the hub's Idioms section. Let Dawn show you how to use Must-Know American Idioms. Learn American English Idioms with our Idioms Online Quiz and Answers Library located on this blog. Grammar: noun The study of classes of words, their usage, and their functions and relations in a sentence. Grammar also deals with usage correct in syntax. Welcome to the Grammar area of our Online English Lesson Article Library. Grammar is the biggest section of learning English and this is the biggest section of our library. You will find lessons on all aspects of Grammar from level one to level three. We also have a full library of Grammar Online Quizzes. Quizzes with answers are a good way to identify where you need to practice. Quizzes also help put the lessons learned into your long term memory. If you have questions on Grammar you may ask the Online English hub’s Teacher Staff for Free using the Online English Learning tree. Don’t forget to visit the Online English Hub’s Grammar section for many more free lessons, video lessons, email courses, and personal instruction on Grammar. Learn Grammar faster with our Grammar Online Quizzes and answers located on this blog. Grammar is not the easiest part of learning English. With the right lessons and resources Grammar is not as difficult as they say. If it ever does get confusing just email one of our teachers or submit your question to the Online English Learning Tree- they are glad to help you. American: adjective Of America. Relating to the Untied States, its people, and languages. Culture: noun The shared beliefs, social behavior, and values of a group or nation of people. Welcome to the American Culture area of our Online English Lesson and Article Library. If you are learning English as a second language there is a good chance you are new to America and its culture and customs in addition to the English language. We can help you. Because the Unites States covers much land and has many different cultures and lifestyles within it, our American Culture lessons focus on a generalized Business English American Culture that can be seen in all American Cultures varieties. Knowing American Culture will help while vacationing in the US, studying in a University, and is especially helpful if America is your new home. If you have questions about American Culture you can ask the Teacher Staff at the Online English hub for Free using the Online English Learning Tree feature. For more lessons on American Culture visit the Online English Hub's American Culture Lesson area. Learn American Culture with our American Culture Online Quizzes and Answers Library located on this blog. "These lessons are so helpful because it's good to know what people like and don't like." Language is a system of systems operating simultaneously. English pronunciation involves meaning-differentiating sounds, meaningful sub-word pieces (e.g., prefixes and suffixes), words, phrases, and entire interrelated chains of ideas, as well as the speaker's emotions and attitudes -- all being signaled at the same time. The goal of the second-language learner must be to produce this complex, simultaneous interaction of systems, moment by moment, and the best way to do that is to hear it all actually happening and then, provided that you have good ear/vocal feedback, you can train your muscles to articulate the right sounds, ever more closely approximating the entire language performance of a native speaker. Sounds: Systematic repetition training is crucial in identifying the English sounds that differ from those in one's own native language (or identifying those that are simply not in the first-language inventory) and in focusing particular attention on the differences. If, instead of the English pronunciation of certain sounds, the learner substitutes a similar sound from his/her native language, he/she can completely obscure the meaning or confuse the native-speaker listener. Further refinement of an accent consists in learning to hear and reproduce the actual English pronunciation instead of substituting the most similar one from one's native language. Contractions: Native speakers plunge ahead so rapidly that English pronunciation typically contracts certain sounds (not just the traditional written contractions), and the non-native listener must be alert to these. He/she must be able to immediately hear them and identify them with the uncontracted versions. Again, the familiarity is a matter of hearing the likely contractions and understanding them in context. Interference: There's so much noise that accompanies speech that you would be surprised at how little of what someone else is saying actually reaches your ears. That's why simply hearing common collocations of words, especially idioms, will enable you to understand and reproduce the “noise-free” versions. Phrases and Pauses: Along with the English pronunciation of individual sounds and sound sequences (and their contracted versions), the learner should pay careful attention to the way native speakers group words into phrases, for, e.g., grammatical reasons, emphasis, or place in a conversation. Repeatedly listening to frequent word groupings and patterns of word groupings, as they're actually articulated, will teach the second-language learner where to expect pauses, how to use them, and the kinds of words-groups are typically included between pauses. Accentuation and Intonation: The relative loudness/softness of each syllable in the English pronunciation of a word -- so easily, rapidly, and intuitively articulated by native speakers -- must be learned and, to the extent possible, duplicated by the astute second-language learner. It's not that the accentuation of a word changes its meaning -- rather, the accentuation pattern of the word is determined in part by its structure, and the absolute loudness or softness of one syllable or another is further influenced by emphasis and intonation patterns in the larger sentence. Rather than memorize complex rules, the easiest path to reproducing the native speaker's performance is listening and repetition. The same applies to the longer intonation patterns that identify statements, questions, requests, and all manner of speaker implications and emotions. These are simultaneous with the word-level accentuation patterns mentioned above and, once again, must be heard in context in order to be successfully duplicated -- and finally learned to the point of replication. Language is a lot of things going on at the same time. And the best way to learn them is to hear them and to develop the ear/vocal connections that enable the second-language learner (or even the dialect speaker) to replicate them all, the way native speakers do. "The effectiveness of PronouncePro as an English pronunciation learning tool is clearly supported by these comments from linguist Alan Perlman, when asked about the role of ear-vocal training in improving second-language skills." © Alan M. Perlman 2009. For use only by PronouncePro.